Wanna learn how to monetize a blog? Great! …as well as practical tools & resources to help you get up and earning in no time. Yes, every blogger CAN make money from their website. It’s just a matter of patience, hard work, and learning. This post covers the learning. Boom. The table of contents below. Feel free to bookmark! This is NOT the fun part, but it’s helpful! FAQ: How Do You Make Money From a Blog? creating and selling digital products such as courses, ebooks, paid webinars, membership platforms, and more. The secret ingredient for ALL of these, however, is building a loyal and trusting following! (through blog traffic and an email list). The blogging about blogging niche (I.e. what I’m doing right this second) is a VERY lucrative one, as people are willing to pay for info products to help them grow their blogs. Do people buy stuff online in your niche? In order to make decent money from your blog, you’re going to HAVE to produce content that matters to people. Period. GROWING an audience depends on readers coming back for more. People don’t return to your site after they see crappy content. This applies to ALL monetization methods too. Ads? You’re going to need massive blog traffic. Good content is the only way to bring that. $700 online courses? Followers need to trust you a TON in order to fork over that cash. Publishing CONSISTENT good content builds that trust. Publishing products (or even ads) into a void obviously won’t monetize your blog. You’ll need a following centered around your email list, as well as various social media platforms. More important than even website traffic….is engagement. Clicking, commenting, replying to emails, etc. You want followers to not only glance at your site periodically…but be INVOLVED in your content, clicking affiliate links and purchasing ebooks because they’ve been around you long enough to TRUST your recommendations. Blog Ads = You earn a small amount of coin every time a website visitor *views* the ad, and a little MORE every time a visitor CLICKS an ad. Difficulty – 1/10 Just connect to a network and install on your blog! Resources – Here’s how to add Adsense to your site. At 50kish views a month, go to Mediavine! The ads you see are from an “ad network” called Mediavine (there’s a huge list of several of these companies below), and another popular one would be the famous Google Adsense. Adsense is great for beginners but pays WAY less than other networks like Mediavine. However, these better-paying networks often require a minimum of traffic! Mediavine requires 25k sessions per month (if you have that already…give them a try! People make a great income at that level). You apply to an ad network. They review your site, check your traffic, etc. That’s it. You’re done. You collect checks. Don’t show display ads on your site until your traffic is sufficient to make real money. At that point, we recommend Mediavine! They pay bloggers MORE money, straight up. So, when we say “native ads,” we really just mean ads inserted within the content itself. Technically, the law REQUIRES these ads to be labeled as ads, but they’re usually designed to blend in with the content. Pros – You have COMPLETE control over what you advertise! You can make sure it’s a fit for your readers! 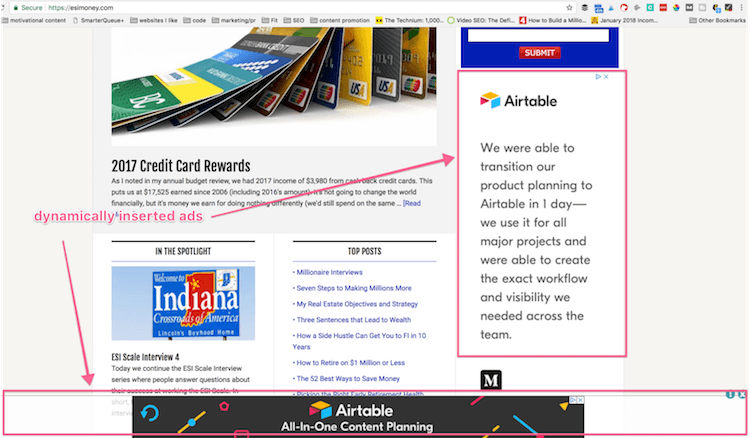 Affiliate link banner ads are our FAVE type of ad, for the obvious reason: we value our readers, and you should value your readers. Affiliate marketing, used ONLY when the recommended products are a great fit for your readers, is a powerful way to make money from ads on your website. 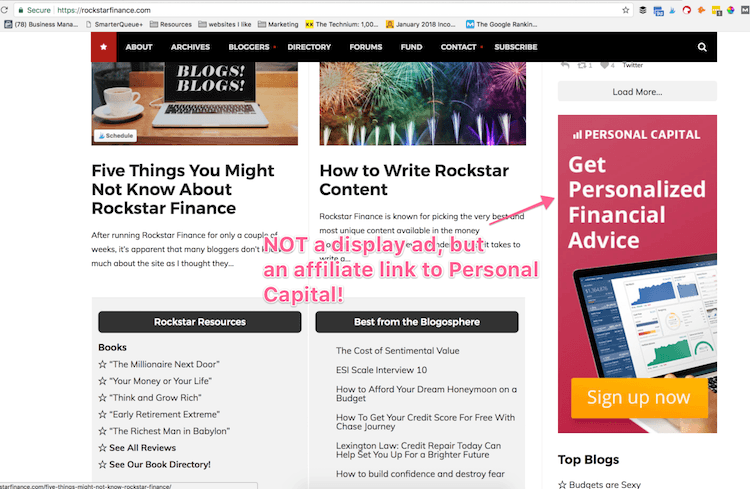 We’ll talk about affiliate marketing in detail below, but you can always share aff links in an ad “format” as well! Don’t spend a ton of time trying to DESIGN ads, ever. It’s not a great use of your time. However, DO grab pre-made banner ads from your favorite affiliate! Almost ALL networks will offer pre-made affiliate banner ads. You’ll almost ALWAYS find these in your affiliate dashboard, and they’ll GIVE you the HTML code to copy/paste into your blog. You retain control of the product ads you serve your visitors = GOLD. So much better than display ads, and likely more lucrative as well. You don’t have to create the products. Somebody else took care of the hard part! You have control over what you advertise so you can recommend only products that are RELEVANT to your readers. FAQ: How do I get started with affiliate marketing? The first step is applying to affiliate programs for products you want to promote. Once accepted, you will grab a “special” or “unique” URL code that you can use to link to their product. When visitors click through your special link and buy the product, YOU EARN MONEY. One of my favorite products to promote is ConvertKit. They are THE go-to for bloggers who do email marketing. If you click on that link, then sign up for ConvertKit, I’ll get 30% of whatever YOU pay them…every single month. Powerful! Resources – Here’s the link to get started and sign up. 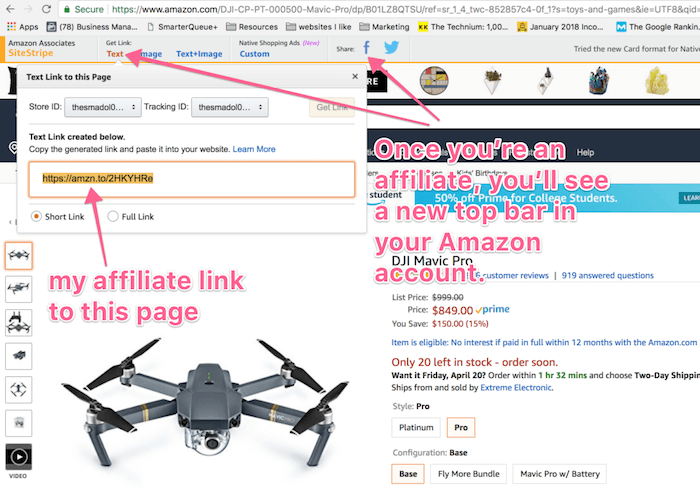 This is mandatory for any aspiring affiliate marketer, as EVERYBODY has something to buy on Amazon. It’s great for all niches! Sign up here for an affiliate account ASAP. This is the most accessible affiliate program out there, and people TRUST buying on Amazon. It’s a fantastic way to promote products and earn extra money. Pros – Access to a TON more products not on Amazon. Ease of access. Cons – Some networks require a strict application, minimum website visits per month, etc. The idea is the same as Amazon above, but instead of your links leading to an Amazon page, they will lead to a specific company or product. These networks contain THOUSANDS of different products and companies to choose from! Pro Tip: Getting overwhelmed as a new blogger? START by grabbing an Amazon Associates account, then start blogging regularly. In time, you will start linking out to other products/companies. THEN go Google “[product name] affiliate,” and see if they have an affiliate program. Apply then. Don’t get overwhelmed trying to apply to 159 affiliate accounts at once. Start blogging, and when you DO start linking to products, apply to their aff programs at that time. Pros – More $$$$ per commission usually! Cons – More log-ins and dashboards to keep up with. 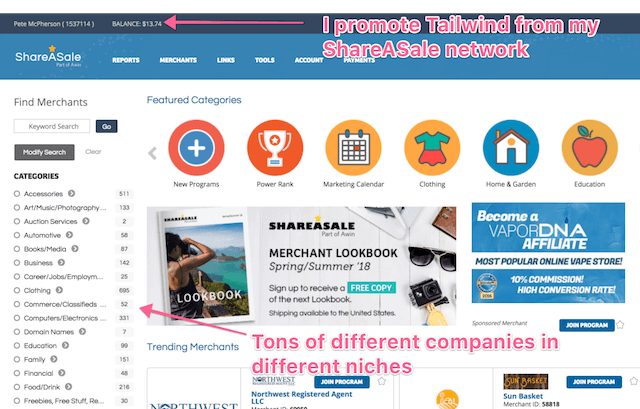 Resources – It depends on your individual affiliate–find their dashboard! Some products and companies aren’t a part of any affiliate networks, but they might have their affiliate programs hosted separately! When I linked to ConvertKit, that was through their own affiliate program, found here. 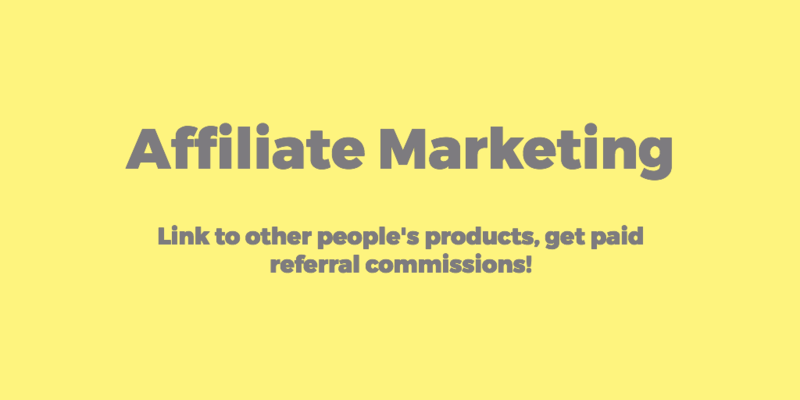 Furthermore, many products have “refer a friend” type of campaigns, where they’ll give you a link, and either a bit of cash or free product for referring your friends! 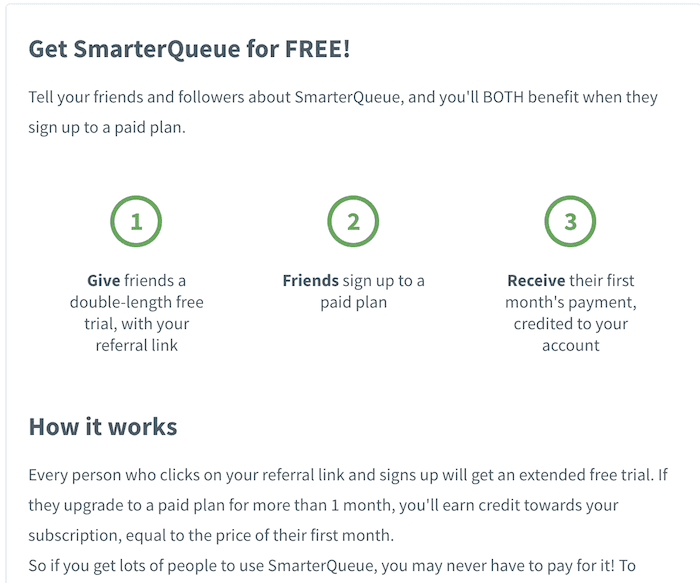 SmarterQueue is my recommended social media tool, and it costs me $20 a month. However, when people sign up via my affiliate link here (which gets them a free month)…I get a free credit! 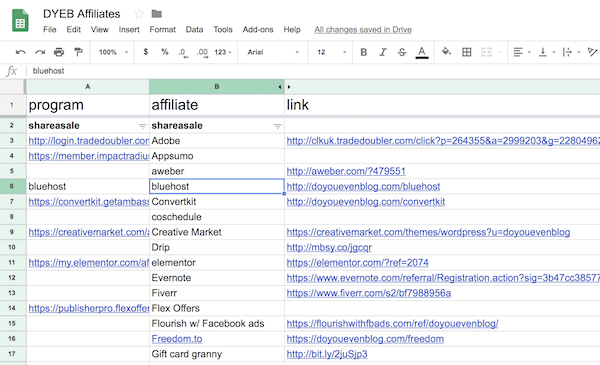 My custom affiliate link tracker spreadsheet. Organized! Resources – Each individual program, but Making Sense of Affiliate Marketing. This just means you’ll be promoting other bloggers info products! (which we’ll talk A TON about below in the products section). See that link above to Michelle’s affiliate marketing course? That’s my affiliate link, and when people buy the program through my link, I’ll make $67. 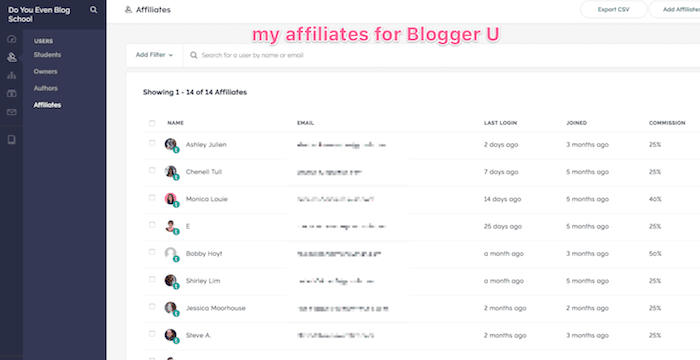 Heck, I have my own affiliate program to Blogger U (my flagship blogging course and membership site). If you’re a new blogger, you can’t just start applying to other bloggers’ products right away. 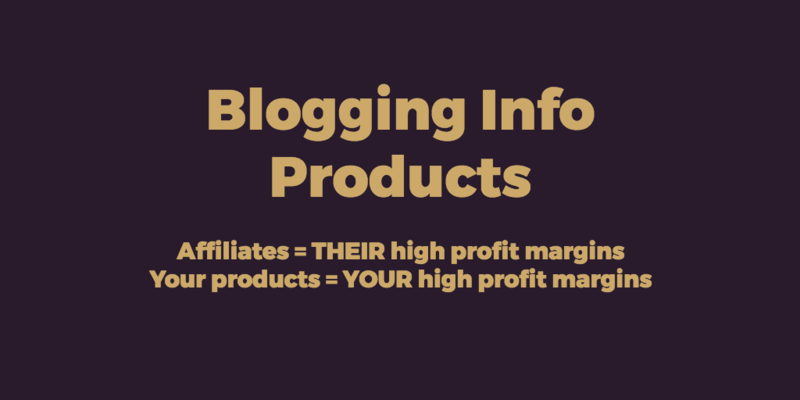 Becoming affiliates for other bloggers’ products happens over time as a natural result of building blogging relationships. However, they pay well. Typically 25%-40%. That’s over $200 PER REFERRAL for premium products like Blogger U and Making Sense of Affiliate Marketing. Some of this might be tough while you’re learning how to monetize a blog, and rightfully so: Creating your own products is advanced stuff. Affiliate marketing means somebody else did the hard work of creating, designing, and launching products. Now it’s YOUR turn to do all that work. Good news though: Monetizing your website with your products doesn’t have to take months. You CAN make money from very simple but valuable products. Cons – Not big ticket items, are surprisingly difficult to sell. Some learning curve required. Resources – Canva for designing ebook covers. This article on how to CREATE and format the ebooks. This guide to publishing via Kindle. Ebook are just like regular books, except that ANYBODY can create and publish them…and they’re read via computer. FAQ: What’s the best format for selling an ebook? The simplest way is to write via MS Word or a Google Doc, and export to PDF. BAM. Ebook! However, you can also publish to be read on people’s devices, such as Kindle. Then you can sell your ebook on Amazon! Liz from The Virtual Campground created a 40+ page PDF, and sells it in the sidebar to her website, bringing in several hundred dollars per month. If you’ve been blogging for a while (and have built up a nice body of posts), you can also pull from content you’ve already written to fill out your ebook. Pro Tip: Wondering what you could write that will actually SELL and make money? If you have access to your blog metrics, (which you should) you can sort all your blog posts by ‘most viewed’…and that will tell you WHICH pieces of content resonate the most with your readers. Create paid products based on THOSE topics! Ebooks easy enough, especially is you’re utilizing free templates…but my guess is you’ll find them DIFFICULT to sell. Especially for decent money. (Have YOU ever paid more than $10 for an ebook? Seems rare). The ebook would have to be EXTREMELY tasty and valuable. And even then, it’s a low ticket item compared to how much time you spend creating it. If you want to teach people via a paid product, online courses are far more appropriate (and profitable) than ebooks. 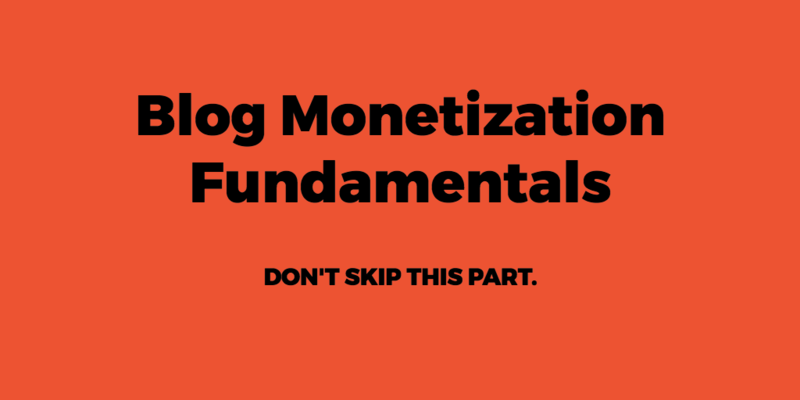 So speaking of which, let’s learn how to monetize a blog via courses! Resources – Teachable for creating and hosting course content. See resources below for tips on getting started. The 8/10 difficulty rating is the hardest and most intimidating for our uber ‘how to monetize a blog’ list. However, creating your own online course is STILL the highest ROI and most profitable website monetization strategy. You can create a course once and sell it for years to come, making the income fairly passive…apart from the initial work of creating. You can price your courses anywhere from $0 (used to get leads, not dollars) to literally thousands. It’s also a preferred format for teaching people things, so your readers will approve! 1.5 years after creating her course, Michelle is STILL bringing in 5 figures a month from it. 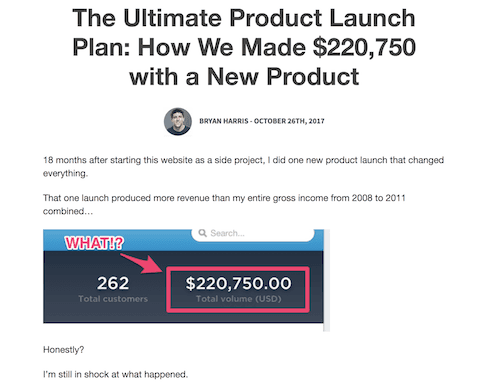 When Bryan Harris had his FIRST product launch for his course 10K Subs, it made over $200k. Took him 90 days to built the actual course. Worth it? He now makes over $1M annually from that course. Overwhelmed? You do NOT need to be making money from an online course like THESE people. It took them YEARS to build an audience that would bring that much revenue. You CAN get started TODAY. You don’t need a huge audience or fancy & expensive software to start making money soon. Only 3 months into THIS blog, with an email list of less than 400 people, I made over $1,500 from my first product launch (an online course). First, here is a fantastic article on how to create online courses for your blog that monetize well, written by my friend Nick Loper from Side Hustle Nation. Step 0 – Find a course idea. This is actually the most important step by FAR. Whatever info product you create, it needs to be something REALLY DESIRABLE to your target reader! Something they want really bad. Ask yourself: What problems or frustrations are my followers facing? What do they need help with? Which problems need MORE than a 1,300 word blog post to solve? Why waste precious time and energy building an online course if you’re not COMPLETELY convinced that your readers will pay you money for it? What better way to validate a blog monetization idea that to actually ASK for money before you build it? Pat Flynn from Smart Passive Income wrote a book called Will it Fly? which details this idea validation phase. Worth reading! I recommend Teachable, only because it’s FREE to start with, and you can start creating content immediately, no set-up required. You can also create and sell products in online course directories like Udemy, or even host them on your own blog…but Teachable seems to be the best of both worlds. This blog post on monetizing isn’t the place to detail this out, but launching online courses to make money isn’t a walk in the park. In fact, it’s hard. Check out this blog post for more info on LAUNCHING products, specifically courses! Overall, building an online course is probably the best way to monetize your blog, but it takes a massive amount of research, planning, building, and then selling. High ROI = lots of work. FAQ: What IS a virtual summit? If a webinar is just you on video presenting (or maybe one guest), a summit is MULTIPLE videos with MULTIPLE presenters over a day or two. Most summits are gathered around a specific topic, like my friend Tom Kuegler’s “Grow your Blog Summit,” which spanned several days and featured video presentations with 25+ bloggers. You choose a topic your blog readers care deeply about. Not doing virtual summits, unless you have a TON of time to organize the event, as well as great connections (to get impressive speakers). It’s simply NOT a great return on investment outside of that. Learn how to monetize a blog in better ways. You CAN sell content itself in different forms! Ok, so TECHNICALLY, monetizing your blog from ebooks and courses IS selling content…but it’s just a different format. Ebooks are delivered via PDF downloads, or Kindle formatted, etc. Online courses are delivered via a module and lesson formats, like a school syllabus, whether that’s via a drip email course, Teachable, or your blog. The following monetization ideas are people JUST PAYING for your content in the totally normal way. I.e. blog posts! (or podcasts or videos). Resources – Read this awesome post with Rachel from Joyful Derivatives, then listen to Jason Zook on Nick Loper’s podcast episode about getting sponsors here. If the thought of emailing influencers or companies and straight up ASKING them for money scares you…this monetization strategy is not for you. Sponsorships = you reaching out to people/companies who want promotion, and asking them to sponsor your content in exchange for money. ANY content. Sponsored posts = slightly different. This is where your content itself is focused on promoting the sponsor. Bobby at Millennial Money Man has a large enough blog now that sponsors reach out to HIM and asked for sponsored posts. However, you don’t necessarily NEED a huge reach and millions of visitors to get a sponsorships. Pro Tip: The key to obtaining sponsorships for your blog is A: finding people with enough money to pay, B: being upfront and honest with your intentions, and C: find the perfect balance of the value YOU provide THEM in exchange for the money they give you. It takes a certain amount of guts, persistence, and patience to pitch people or companies for sponsorships. If you feel you have what it takes to deliver this type of value, and are comfortable pitching people and getting rejected, this is an EXCELLENT and quick way to monetize your blog. But be honest with yourself, if this isn’t you, move on to other methods! 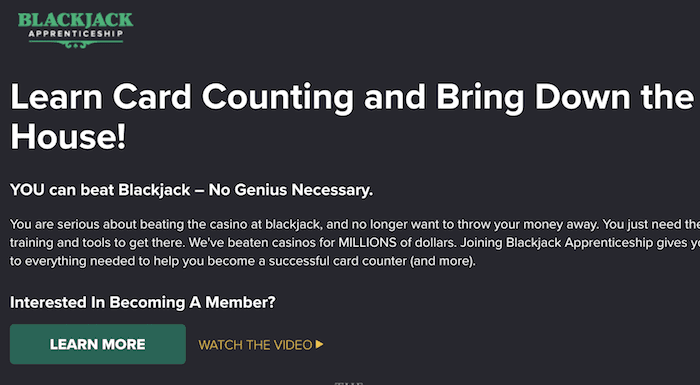 However, the most POPULAR model to monetize with a membership is with RECURRING revenues. First, you must have content worth paying for. If people don’t think it’s valuable enough, or if it’s just glorified blog content…you’ll have a hard time finding sales. Next, you’re going to have to put software in place to restrict access to member content. More on that below. Last, you need to KEEP making it worthwhile for people to be members. This means adding content consistently. That’s a TON of work probably. Paid Memberships Pro – You can start restricting content and charging people for memberships today, for FREE, but it lack features. MemberPress – There’s no free version, but it’s extremely affordable, and offers a ton of features! Restrict Content Pro – Another popular choice for WordPress. 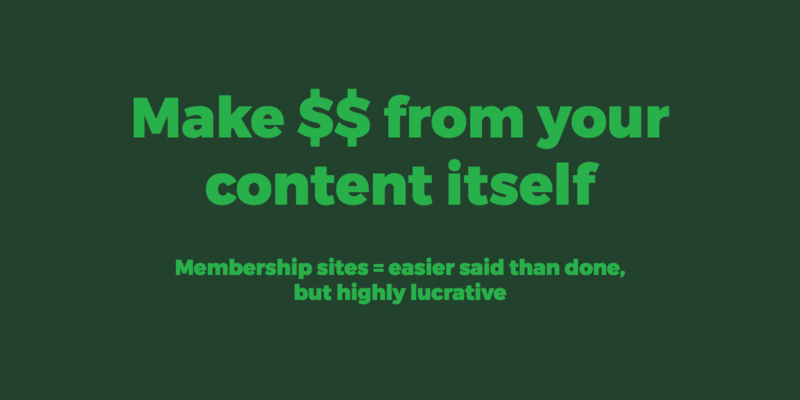 If you’re looking for a profitable (but more difficult) way to monetize your website, but want MORE than a stand-alone course…a membership site is what ya want. I’ll say this again, you absolutely need content worth paying for though. There are definitely easier ways to monetize a blog on WordPress…but this can be INSANELY lucrative if you nail it. Pros – Um. Lots of cash in bulk? Cons – You lose your blog, and your blog needs to be valuable! The ONLY reason ‘flipping your blog’ is an actual way to monetize…is because there are actually a ton of people who do it professionally. In fact, there are people out there who start “niche websites” or “authority sites” with the sole intention of selling the blog once it starts getting traffic and ad revenues. FAQ: At what point would somebody sell their blog? Websites that generate significant traffic are worth money. While there is no minimum traffic for selling a blog, you won’t be able to sell for much until you are generating traffic capable of earning a few thousand dollars a month…even if it is NOT currently making that! Since we’re learning how to monetize a blog…that implies we’re actually going to keep the blog, so we won’t spend a ton of time on this. Still, just know that at some point down the road, if you blog consistently and start ramping up traffic, blog ad revenues, etc…you likely could find a buyer! People need content, are too lazy to produce content, and also too lazy to hire and manage freelancers? They buy PLR. And folks like US could potentially sell our content to them. There are TONS of legal stuff to this, as well as competition, but it can be done I suppose. My thoughts? Don’t bother lol. Better ways to make money. 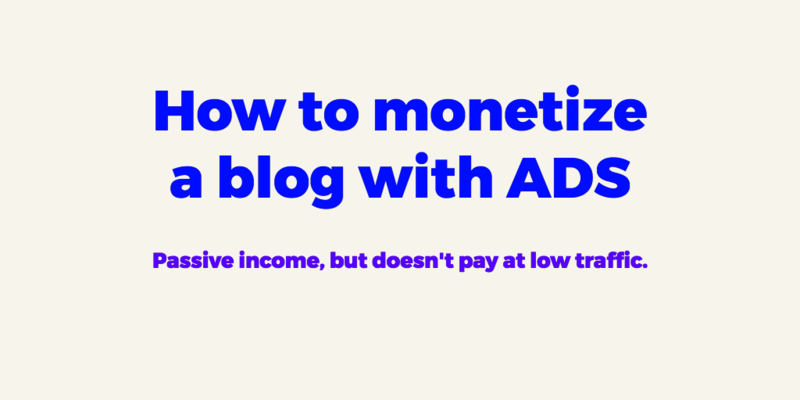 This might be a little controversial…as you technically WON’T be monetizing YOUR blog…but rather making money from other people’s websites, etc. Important: Personally, I recommend freelancing 1,000% percent. The reason? For almost all other ways to make money…you need to spend time building traffic and cultivating a following! (who will pay you money). 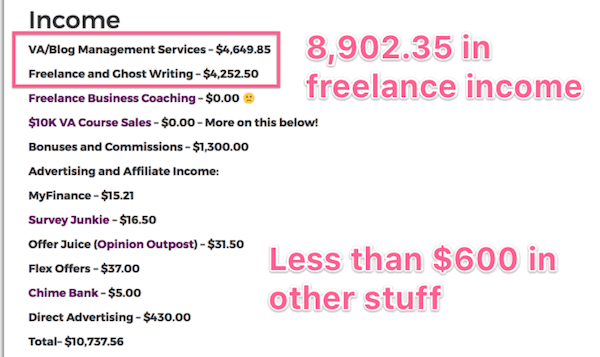 For freelancing, you need only match up your skills with other bloggers willing to pay you to perform them…of which there are plenty. Resources – My blogger outreach templates for pitching people. Twitter for building connections (more below), blogging Facebook groups. At the time of this writing, I still maintain 3 freelancing clients, which earn me anywhere from $1k to $3k a month. I would NOT have found these gigs if I hadn’t started this blog. Nick True from Mapped Out Money runs his own blog and YouTube channel, but actually makes full-time income from only 2 blogging clients. Kayla Sloan runs a Virtual Assistant business and works for other bloggers. She made over $100k in 2017. Kayla is a VA for other bloggers and entrepreneurs. 6-figures a year! What skills do you have, or are really keen on improving on? 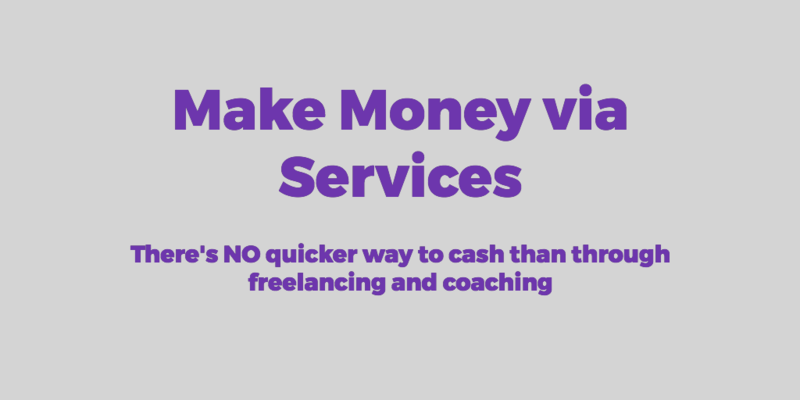 You DON’T need world-class freelancing skills in order to make some money! You just need to find 1 or 2 skills you enjoy working hard at and learning about. Can you run Facebook Ads? Make pretty Pinterest images? Organize schedules and manage inboxes as a VA? Can you write more good? All of us have something to offer other bloggers, it’s just a process of finding what that is and matching it with what other people need. First, here’s a great post from The Penny Hoarder for finding freelance writing gigs. You’ll see several “marketplaces” for people looking for freelance bloggers! However, those can be quite competitive, as can HUGE freelance sites like Upwork, etc. You won’t make much blogging money from these. Bad = cold emailing other bloggers and asking if they need help. Though it’ll initially take longer, focusing on building REAL friendships in your communities WILL make money over the long run, and this could very well mean freelancing income as well. Pro Tip: When pitching for freelance work, always ask for things HONESTLY and transparently. Furthermore, asking for referrals is far more powerful than asking for. things directly! Also, send follow-up emails and be persistent. 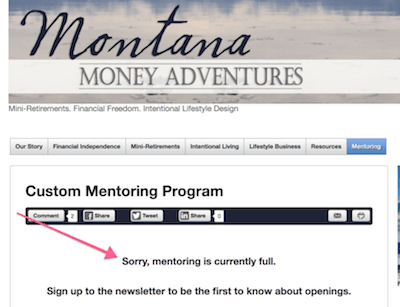 Jillian from Montana Money Adventures is a blog coach AND money mentor…and has more inbound requests that she can handle. 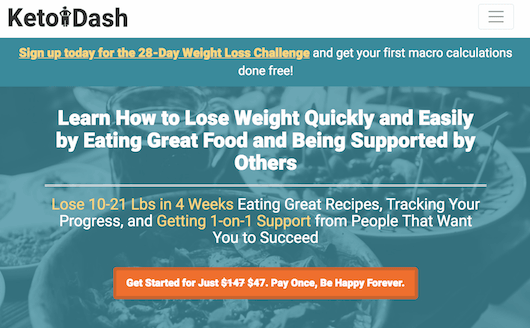 Whether you blog about gardening, the ketogenic diet, or personal finance…there will always be individuals who want 1-on-1 help, and are willing to pay for it! However, you can’t just start a blog one day and hope to make money coaching the next. Why should people trust you? You need to build up that “authority” first. You may not want to hear it, but I don’t think anybody should start coaching their readers until they’re being asked to. If you really have to sell it, you’re not ready yet anyway. However, it couldn’t hurt to create a separate page on your website where readers could browse through your different service offerings. A “coaching” or “hire me” page could make money one day. If you’re really looking to make money blogging, you should know that it takes WORK. There IS no get rich quick option, nor is there any one “best” way to monetize a blog. You’ll have to figure some things out for yourself! In fact, the ACTUAL best blog monetization strategy is to constantly try different things out until you find what works best for YOU. Then double and triple down on that. So what will it be for you? Leave me a comment below and share what strategy has brought you the most money from your blog! If you’re a new blogger, what are you most excited to try? Pin if you enjoyed this article! Seriously, awesome content Pete! This gets a share! haha yay thank you Mike! 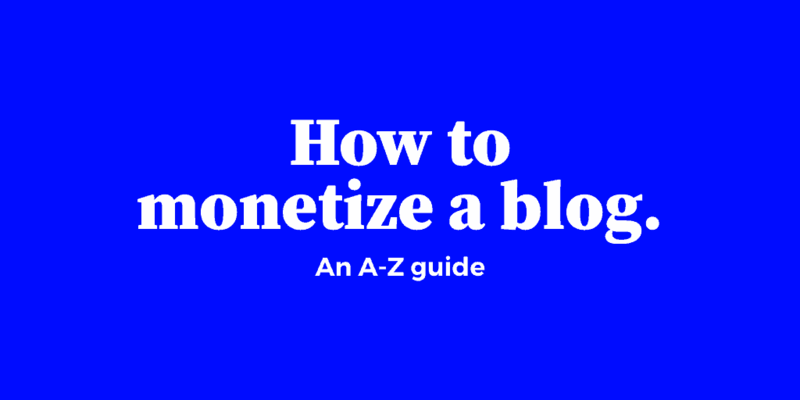 That’s an amazing article on monetization, It’s really helpful for as I’m a newbie in affiliate marketing your article really help me to choose which one is better for my sites. Glad to hear it TtR! I needed this so badly! Thanks! Whoa! Great stuff here. Thank you for the comprehensive (and inspiring!) share. Definitely going to be checking out the sponsored posts podcast from Mike Loper you reference. Really starting to get a lot of requests and I have no idea what to charge. Great post Pete! How long did it take you to write it? Going on month 9 and still barely getting any traffic and no engagement. But keep trying, right? Great question. Maybe about 15 hours in total? Maybe more like 20-23 actually. And email me a few more stats and metrics CJ. Let’s see what we can do. Aw, man. You’re raining on my membership site parade, Pete. I used to make most of my money designing and building websites for people. For about a thousand and one reasons, I wound up hating my business. I shut it down last October, then launched a new thing that’s more heavily focused on content than services, and fellow misfits and mavericks instead of traditional businesses. I have implemented some of the monetization strategies you mention (small services, affiliate networks & single program affiliate links), but I don’t have the necessary traffic (yet!) to make the passive stuff pay. I’m already doing video walk-throughs in a private FB group & getting positive feedback. I thought this might translate into a membership site of some sort. I do need to figure out whatever it is that will pay the bills, but the membership thing is so attractive b/c it’s a super-cool way to help people like I do in the FB group. The big difference, besides possibly charging for membership, is that I could actually engage them more than FB allows. Very nice synopsis and well laid out. I’m fasinated with all the blogs making a killing every single month! I’ll definitley bookmark this one for later. Cheers. I love how comprehensive this post is! It’s nice to have one piece now that I can always refer back to instead of having to Frankenstein together a bunch of different articles. 🙂 Thanks for being here, I appreciate you! I read this when you published on Monday and bookmarked with a note to come back on the weekend to re-read. Well I didn’t wait for the weekend and re-read this today while eating my lunch. Such a comprehensive list but fine-tuned with the usual Pete & DYEB laser focus. I am about 10 weeks into my own blogging journey (and $117 in revenue…haha) but this type of resource is evergreen and will continue to deliver value as time passes and the MM blog grows so that I can better implement some of these strategies. Adding to the Momentum’s Finest roundup tomorrow! When I first started blogging (in 2007) I monetized my blog only with ads and some services that I stopped providing after a short time. For a few years I made a good income just on ad revenue, but there was always constant pressure to keep traffic increasing. 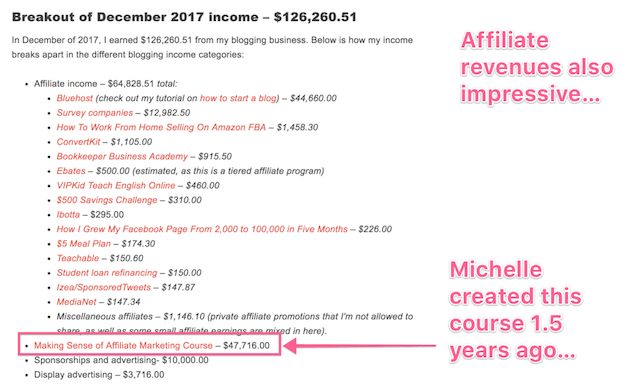 After I added some other revenue streams like selling digital products, affiliate programs, and membership, my income increased pretty rapidly. Selling digital products has been my favorite way to make money from a blog for the past few years, but if does require some work. Thanks for the great article Pete. This is a great roundup – I love how it’s clean and easy to use. My question with affiliate blogging (and one I can’t seem to find an answer to, no matter how I structure my query), is, what is the best way to handle the tax portion of the affiliate program applications? And then, how do you structure your bank accounts and manage purchases for blogging and paying yourself? Thanks for any insight you can provide! Just wanted to follow up as I can’t seem to find great resources on the personal finance side of blogging! When you set up your affiliate accounts, how did you file (individual contractor, as an LLC, etc.)? I just want to make sure everything is completed correctly at the beginning rather than dealing with things after an issue arises! Bah sorry Krystal! This one slipped by me. For tax purposes, an entity really doesn’t matter, as whatever we’d (99% of bloggers) would do is create a pass-through entity (so we’d only get taxed once on earnings), i.e. a single-member LLC or sole proprietorship. This would mean forking over your SSN instead of an EIN, etc. As far as bank accounts, I’d say don’t change anything, add new accounts, etc–until you’re making $20k-30k a year. Just keep your receipts from all blogging-related expenses, and add all that up on your individual tax return (schedule C)! Once your business is to the point of making enough income to warrant financial statements, or spending enough so that it’s really hard to keep track of–creating separate business accounts might make it much easier. Hey, great post. Quick question, how did you develop the table of contents? Do you use a plugin? If so, which one? Thanks! Would you be interested in reading a tutorial on this? I think one other person asked as well. Thanks for clarifying. Yes, I would be interested. Thanks! Wow. Really nice article 🙂 Good job! Hi Pete, awesome information collection! Thank you for sharing. Looking forward to trying some of these money making options. This is an incredible post. I’ve got so many tabs open right now just from this one post! Looking forward to learning much much more. Thanks for sharing! Thanks for being here, and good luck sifting through the tabs! Nice post! I’m proud to say that I have managed to create my very first blog post for my website, and I’m excited to put everything aside to make this work. I have been doing guest post outreach for businesses and bloggers for while before I decided to create my own site. Aw. That’s very kind of you Angeline, and I’m happy to hear that! Hey~ Just wanted to say thank you for what you do! I love listening to your podcast. It gave me the push I needed to keep going and working at this crazy blogging thing. There isnt much to look at but check me out at darcilou.com if you would like! and please do–Yes, it’s crazy, difficult stressful, etc–but can also just be fun and rewarding (if we let ourselves celebrate the small wins). Let me know if you need anything! Checking it out now. Another great article! Quick Question: Do you recommend WooCommerce? As I read the section on ebooks, I didn’t see any recommended products/tools fore commerce. Looking forward to hearing your thoughts! Thanks, Pete! Hey Margo! It depends on what you’re selling probably–and the level of advanced features you need. If you just need the basics of ecommerce–Woo is fantastic. The big downside with them is you have to pay for advanced features separately via add on plugins. It is a fantastic free option though! Thanks, Pete! That is what I needed to know. Appreciate your insight! might be but certainly you’re going to a well-known blogger in the event you aren’t already. This is so needed and extremely helpful. THANK YOU, you’re awesome!